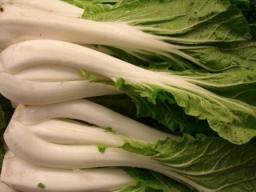 Chinese Cabbage (Pak Choi/Bok Choy) has a smooth, dark green foliage on top of pure white stalks, firm and crisp to the bite. The flavor is quite mild, tender, and succulent. Chinese cabbage is a cool season annual vegetable, and is quick maturing. Diseases: Pythium Damping-Off - This disease commonly affects seeds and young transplants and is caused by the soil-borne fungus. There are many kinds of Chinese Cabbages which are grouped by size, shape, heading and non-heading. Here's a GREAT Chinese Cabbage site I found with more varieties than can be counted. 'Dwarf Choy Sum' - Short White Stalk. Can be harvested anytime during growth. Excellent for stir-fry. 'Extra Dwarf Choy Sum' - Unique baby Choy Sum. Easy to grow.